U.S. veterans have gained a wealth of skills and experience. Veterans want to work, but are still having trouble staying employed. “Approximately one out of two (53%) separating Post-9/11 Veterans will face a period of unemployment. While national unemployment rates have declined, the on-theground reality is that half of our Veterans enter a period of unemployment upon transition. Veterans want to work and are not relying on the full term of their unemployment benefits. 95% of Veterans will connect to employment before using the full 26 weeks of unemployment benefits. However, the average duration of unemployment is on the rise from 18 weeks in the last 6 years to 22 weeks in 2013.” – 2015 Veteran Economic Opportunity Report, U.S. Department of Veterans Affairs. This year, the U.S. will see unprecedented numbers of service members transitioning from the military as we draw down in Afghanistan and face tighter defense budgets. Veterans need help transitioning to the civilian workforce and communicating their skills and background in terms employers can understand. One of the keys to successfully transitioning veterans from military life to the civilian workforce is mentoring. The HSFA Veteran Engaged Technology (VET) program helps veterans successfully enter the civilian workforce with tailored training workshops, mentoring resources, mental health screenings, and healthy peer interaction. 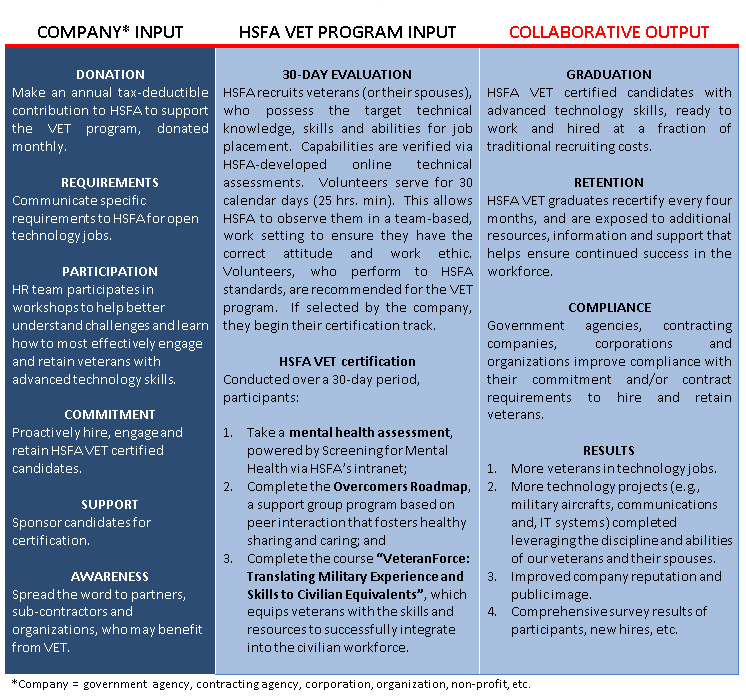 HSFA VET also works with HR departments to ensure government contractors, agencies, corporations, small businesses and organizations hire, engage and retain veterans with advanced technology skills.